As Apple's iPads get progressively more powerful with each successive generation, users are turning to the device for complex computing tasks once reserved for PCs. Helping speed along the tablet-as-PC-replacement movement are advanced productivity apps that turn the iPad into something more than a content consumption device. From drawing apps like Paper, to Apple's own iLife and iWork suites, users have a wide range of software with which to create. 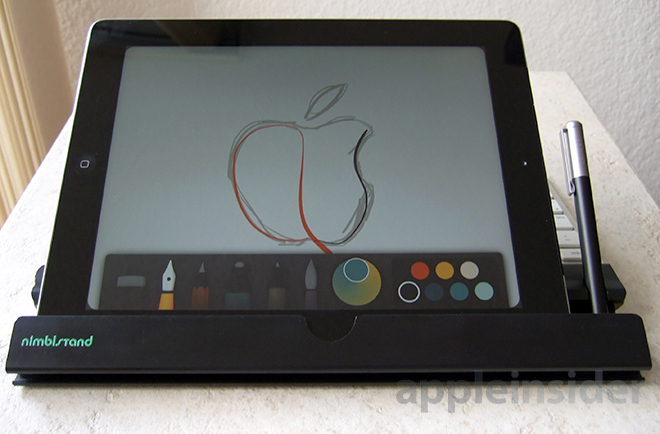 While Apple's iPad has been proven to be a competent digital sketchpad, its utility as a primary or supplementary business machine has been debated ad nauseum. Critics have said the lack of a physical keyboard is a serious stumbling block, even for the large-screened 9.7-inch iPad Air. As Apple does not make an official keyboard case, third-party manufacturers have taken it upon themselves to solve the perceived problem, but with mixed results. Nimblstand looks to shake things up with a unique convertible, portable design that offers baked in support for one of the best Bluetooth keyboards on the market: the Apple Wireless Keyboard. At first glance, nimblstand doesn't look like anything special. Its black, 193-gram ABS frame feels as one would expect, light and relatively sturdy, with a little bit of give in unsupported areas. Turning it 90 degrees, however, reveals an impressive cross-sectional view of nimblstand's "exo-skeleton," vaguely reminiscent of an aircraft wing's ribs. The profile, too, looks like it was designed with aerodynamics in mind, taking on shape that can be loosely defined as an airfoil. Out of the box, nimblstand supports any tablet with a thickness less than 9.6 millimeters, while "phablets" and smartphones under 150 millimeters (5.9 inches) get their own central cutout and can be up to 14 millimeters thick. 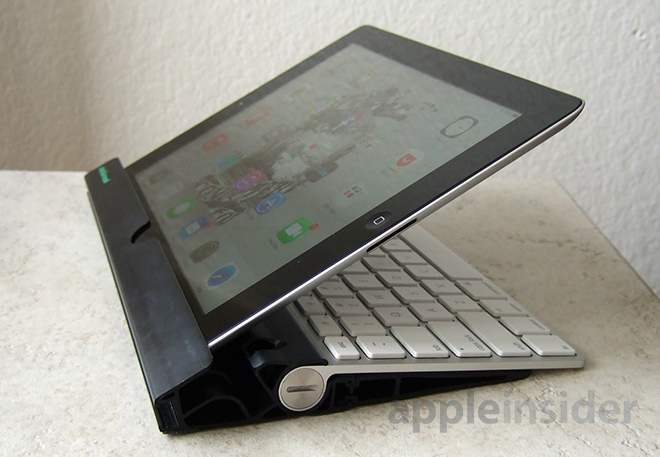 The stand consists of two major parts: the main device holder and a supporting "extension wedge" that can be detached and reattached depending on an iPad's orientation and operating environment. Manufacturing tolerances are obviously tight as the two plastic parts slide together nicely for a snug fit. 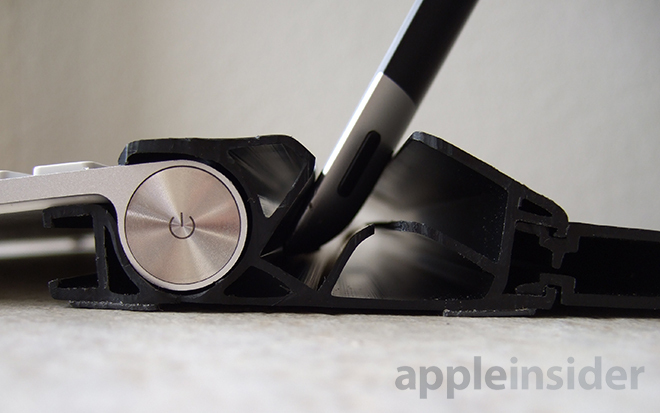 In "extended mode," nimblstand uses the wedge to steady itself while an iPad is propped up on a desk or a user's lap, like a rigid version of Apple's SmartCover or SmartCase. Swapping sides puts the stand in "compact mode," which basically hides the wedge under an attached Apple Wireless Keyboard. The iPad can be placed in the slot facing the keyboard for an upright angle suitable for typing, while swapping slots offers a more raked angle for drawing and watching movies. On the bottom, operating instructions are screened directly onto the plastic, with two strips of non-slip rubber running the length of the stand for grip. There are cutouts for home button access in both typing and drawing configurations, and a small hole positioned on the right of the keyboard insert barrel allows users to see the device's status LED. Opposite the status window is an inkwell meant to hold the optional Wacom Bamboo Stylus, but the cavity is large enough to hold any standard writing implement. Our unit had some issues with flashing, or excess material from the extrusion process, but this did not negatively impact the stand's usability. In our testing, we found the plastic to be durable, if not "cheap feeling." Users who don't rely on device cases may want to be careful when nesting or un-nesting, as debris caught between the ABS and iPad could potentially leave scratches. On that note, all iPads and iPhones are compatible with the product, including those protected by covers. For reference, the device nesting slot is three-eighths of an inch wide. 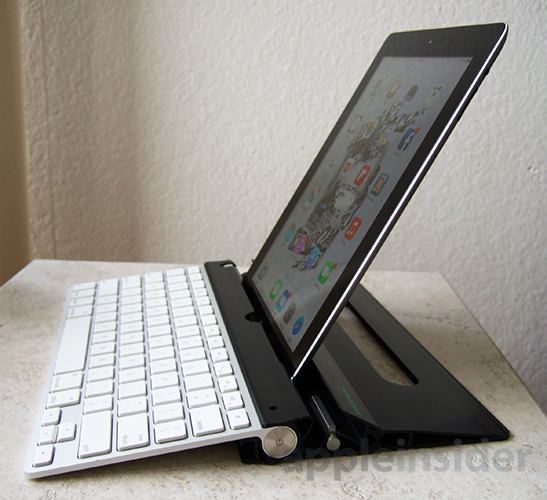 Unlike a SmartCover, nimblstand does not physically attach itself to the iPad. 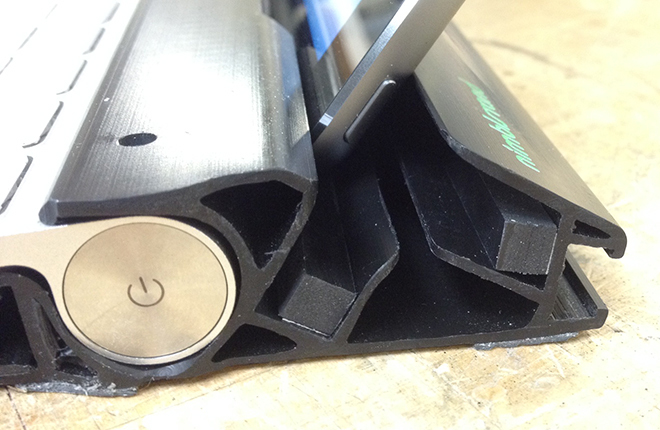 Instead, the stand employs what the company calls "gravity nesting" to hold tablets or other devices in place. 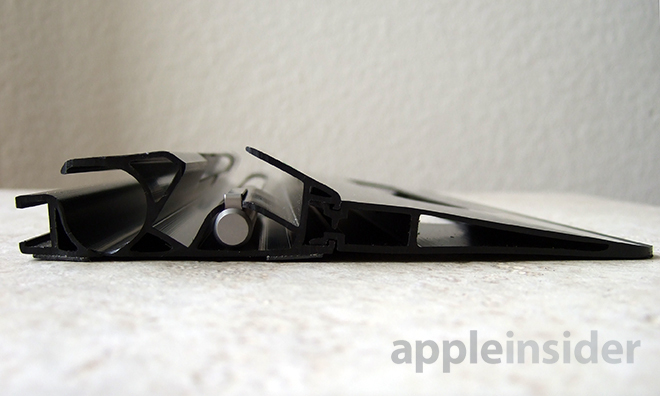 In practice, an iPad or iPhone slips into one of the two angled slots, and leverages its own weight to keep from wiggling. When using nimblstand for touch-based input, we found the nesting method to work well with just about every gadget we tested. Even in our lap, the stand held the iPad in place without slipping or sliding. In comparison to Apple's Smart cover, nimblstand lifts the tablet up more than two inches higher from a flat surface when in drawing mode. The height is good for desks and chairs, but may not be raked enough for users who prefer to sit or lie on the ground while drawing. Typing is one of nimblstand's major functions, and the product is for the most part a solid performer. Desk use is definitely a strong point, with spot-on keyboard positioning keeping front-to-back wobble to a minimum. Because Apple's full-size Wireless Keyboard is used, the typing experience mirrored desktop use, albeit with a much closer screen. We found ourselves using nimblstand as a supplementary typing tool, or second screen, alongside our main rig. 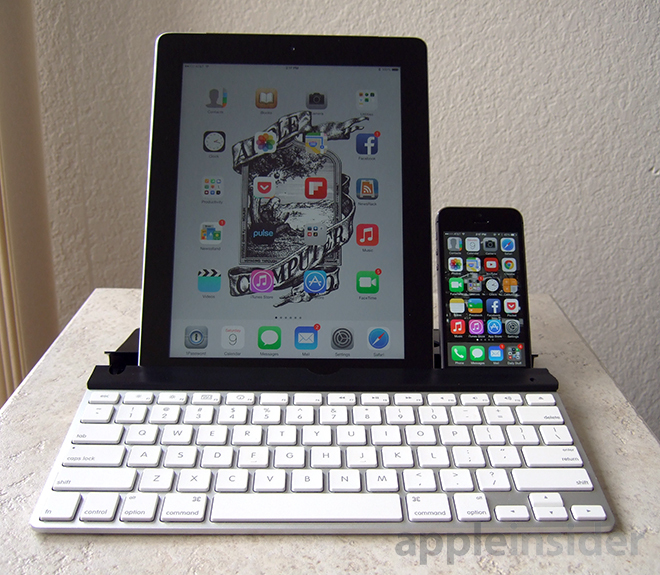 In testing, we slotted in our third-generation iPad and iPhone, keeping both within reach throughout the day. Offloading email and quick note taking duties to the iPad was quite nice, as we were able to read messages quickly and shoot off replies without opening the Mail app in Mavericks. This is especially helpful for laptop users already squeezed for screen real estate. Lap use was a different story. While we are keen on the idea of getting some typing done from the comfort of our couch, the iPad and Apple Wireless Keyboard are simply not wide enough to create a stable platform on our lap. The setup moves whenever text is entered, making the system somewhat of a pain to use. Drawing in a sitting position is great, however. Nimblstand's tilt angle is especially well-suited for inking and mark up work while lounging, allowing for extended periods of use without neck or back fatigue. Testing portability, we threw the stand, keyboard and iPad in our bag and toted the package to a nearby coffee shop. While there, we were able to watch a movie and chew through a few emails before heading home. With a fourth-gen iPad, combined weight is comparable to an 11-inch MacBook Air, but with the new iPad Air, the package is substantially lighter. Form-fitting cases and stands usually have a lifespan equal to that of the device for which they are built. For example, the third-generation iPad was slightly thicker —by 0.8 millimeters —than the iPad 2, a change made to accommodate the larger battery powering its 9.7-inch Retina display. While some accessories were able to take the change in stride as the overall form factor was left untouched, other products needed retooling. Such is the case with Apple's iPad Air. The new slimmed-down bezel design causes nimblstand to obscure the bottom portion of the tablet's Retina display. To cope with these inevitable changes, nimblstand has made a "sustainability promise" to owners and will provide a solution to bring the product up to spec with the latest designs. 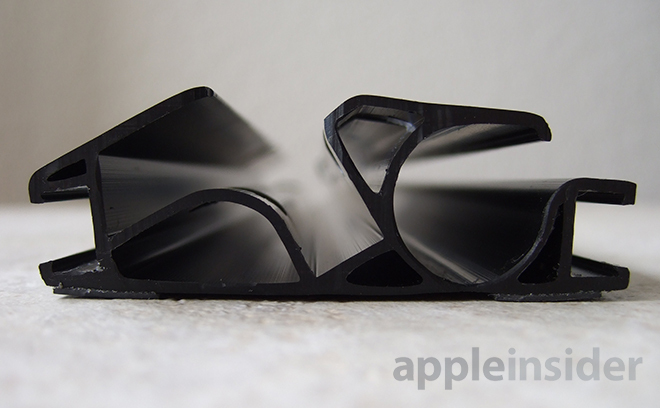 For the iPad Air, the company is sending out adhesive-backed spacers to be attached in the tablet nesting slots, effectively raising the device to optimal viewing height. nimblstand will continue to offer similar tweaks down the road as form factors mature and new devices are announced. Additionally, for those eco-minded users, nimblstand points out that the unit, packaging and all paper materials are 100 percent recyclable. 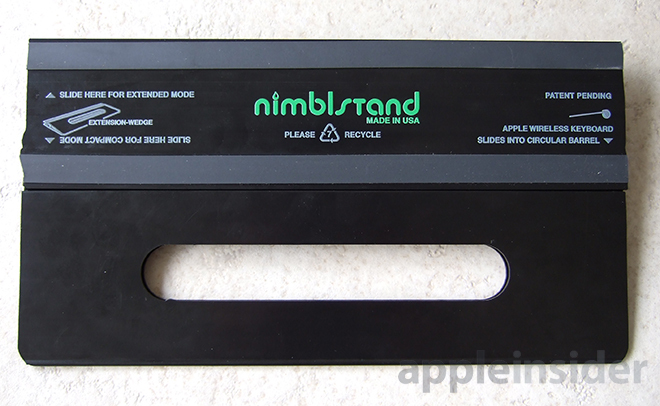 Nimblstand is an interesting product. It performs well in many areas thanks to its unique design, but with a few caveats. 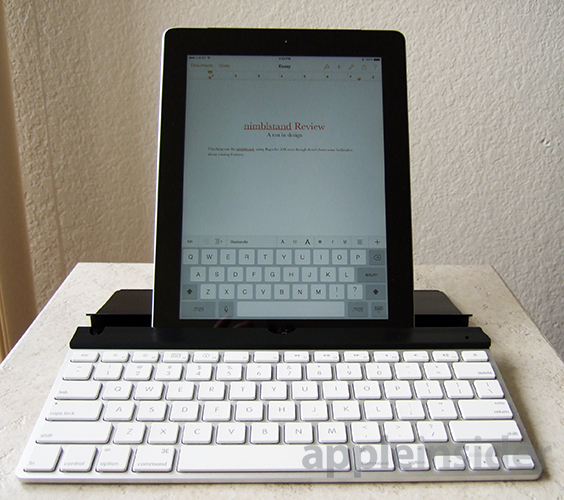 We found nimblstand makes the iPad a true second screen device, easily besting comparable offerings with its use of Apple's Wireless Keyboard, which comes in 15 different languages. Of course, this assumes an iPad user already owns the Apple-branded product. If not, that's an extra $65 investment and possible deal breaker. Using nimblstand as an inking or drawing stand is great, especially with the built-in inkwell and correct tablet nesting angle. Desk and lap use in this mode are comfortable and ergonomic, but as mentioned above, users who sit on the floor may feel a bit constricted. Typing is top-notch on flat surfaces like desks. Lap use may be fine for casual tasks, but we found it too shaky for serious typing. Nimblstand isn't nearly as portable as a SmartCover, but then it's not meant to be. What the product offers is a cohesive and solid mating solution with one of the best full-size keyboards on the market, making the iPad more of a creator's tool than content consumption device. 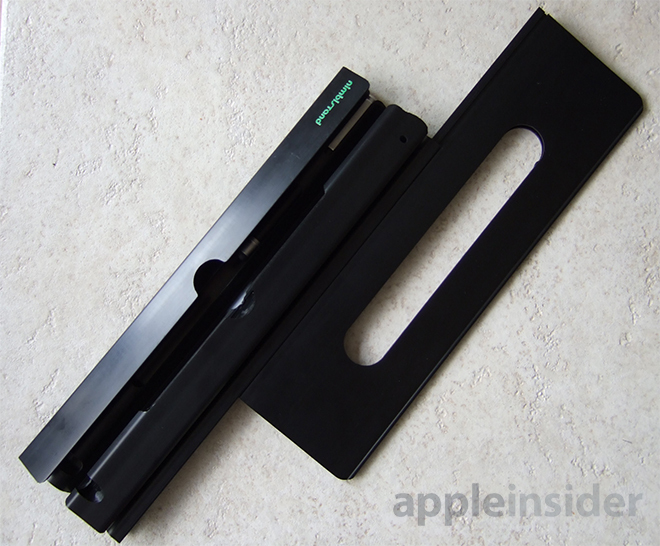 If you're looking for a second-screen solution or rigid drawing stand and already own an Apple Wireless Keyboard, nimblstand is worth a look. Nimblstand is being offered at an introductory price of $39.99, while a bundle including Wacom's Bamboo Stylus is also available for $56.99. Both can be purchased directly through the company's website.